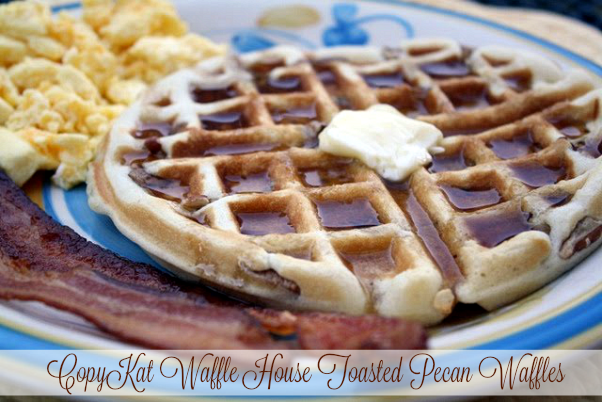 A Copykat recipe for Waffle Houses Famous Fluffy - Toasted Pecan Waffles! Does anyone else enjoy having breakfast for dinner? In our house we try to have breakfast for dinner at least twice a month. I love breakfast, because it's fairly simple to make perfect when I don't know what else to cook for dinner. My kids really love eating breakfast at dinner time. Now I'm not talking about frozen pancakes, but breakfast from scratch! Isn't that always the best? Homemade buttermilk biscuits with sausage gravy, fluffy pancakes, omelets, homemade hash browns, southern biscuits & chocolate gravy, cheese grits and french toast. Now that's what I'm talking about. With the prices of groceries skyrocketing breakfast is a great substitute for dinner. The reason it works so well in our house is because I always have items on hand to make an easy homemade breakfast. I know it's not for everyone, but I grew up eating breakfast for dinner. My mom raised four kids so eating on a budget was a must in our house. The other night when I suggested breakfast for dinner, waffles were the first thing the kids shouted out. I had a recipe for a copy cat version of Waffles Houses Toasted Pecan Waffles that I've been dying to try. The original recipe stated to refrigerate the batter overnight, but we used it right away with no problems. I might try that trick next time to compare and see what version I like better. I used my Belgian waffle maker and the waffles came out so light and fluffy. Instead of mixing the pecans in with the batter, I just poured the batter in the waffle iron and then sprinkled the toasted pecans on top. This recipe is definitely a keeper in our house. How about you? Do you like breakfast for dinner? Combine the flour, salt and baking soda in a medium bowl and stir to combine. Lightly beat the egg in a separate medium size bowl and combine with the sugar, butter, and shortening, mixing well until smooth. Add the milk, buttermilk and vanilla extract; mix well. Add the flour mixture to the wet mixture while beating and mix until smooth. If you can, cover and chill overnight, but this is not necessary because the batter can be used immediately. Preheat the waffle iron and rub with a light coating of vegetable oil (do not use non-stick spray). It leaves a sticky film on your waffle maker. Leave the batter out of the refrigerator to come to room temperature a bit as your waffle iron is preheating. Spoon 1/3 to 1/2 cup of batter into the waffle iron and sprinkle some toasted pecan on top of the waffle, cook for 3 to 4 minutes or until the waffles are light brown. Preheat oven to 350 degrees. In a small bowl toss pecans with melted butter until evenly coated. Use about 1/2 tablespoon of butter for every cup of pecans. Spread the pecans in a single layer on a non-stick cookie sheet or use parchment paper. Bake for 15 minutes, watch closely. Cool completely. You can also toast your pecans in the microwave. Click here for directions. I toasted mine in the microwave without the addition of butter. Sometimes I have breakfast for dinner too! It is a change and a break from the regular dinner and a welcome change too! The kids are not complaining! This waffle is a great idea, I really got to get a new one to replace my old faulty waffle maker. Thanks for sharing. I LOVE waffles!!! I also grew up eating breakfast for dinner, but it's not often that I do it now. My husband gives me strange looks when I serve him pancakes in the evening. :-) We do have "fancy" breakfast every weekend, though, and I love to make waffles then. So good! We love breakfast for dinner. Pancakes, sausage biscuits, and eggs. Anything really! I need to buy a waffle maker! These sound delish. Shannon I got mine at Targer for a really good price. I love the Belgain Waffle Makers. Love Pecans Waffles from Waffle House, yummy!! I grew up eating breakfast for supper too - love it!!! We love breakfast for dinner, but we never have waffles because I don't have a waffle iron. I think I need to invest in one! Breakfast for dinner is even better than breakfast in the morning- so much more relaxed! These waffles look great! We call it "Brinner" , when we have traditional breakfast foods for dinner. I look forward to it, always a nice change of pace. What lovely looking waffles. Great idea to add that toasted pecan flavor to them. Lori,I love to make Belgium waffles, I like add rum extract, or a butter rum to the batter, sometimes you can find it as a single bottle flavoring, Or LorAnn flavored oils are good, but very potent so use sparingly. It gives the waffle a nice little flair. I also add a bit of sugar crystals (Usually found by the cookie/cake decorating area) to the batter and it gives it a sweet and crispy texture. It's also wonderful to make a butter rum sauce to top the waffle off with!!! Yumm-O!!! Lori Said...I love to make Belgium waffles, I like add rum extract, or a butter rum to the batter, sometimes you can find it as a single bottle flavoring, Or LorAnn flavored oils are good, but very potent so use sparingly. It gives the waffle a nice little flair. I also add a bit of sugar crystals (Usually found by the cookie/cake decorating area) to the batter and it gives it a sweet and crispy texture. It's also wonderful to make a butter rum sauce to top the waffle off with!!! Yumm-O!!! Please visit, and have an awesome week. The kids and I love to have have breakfast for supper! My hubby didn't grow up with it and thinks it's weird - only once he smells it he wants some LOL. We usually do supper breakfast when he's gone at supper time. Just made these for my sweet baby girl. We loved them. I love the waffle house but we don't eat at ours because it is a smoking restaurant. Now thanks to this wonderful recipe looks like I don't have to have an allergic reaction to enjoy the yummy waffles. These were better because I topped them off with fresh strawberries, whipped cream, and powdered sugar. The recipe made them have a delicious sweet cream taste. I love this recipe. Waffle House Toasted Pecan Waffles are also my very best favorite! I can't go by the place without stopping and getting them. Thanks! Oooooooo,,,these look soooooo good,, I'm definitely gonna try,,! !